From maps to dinosaur fossils, a preteen keeps sleuthing. 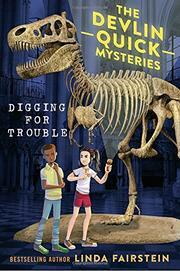 Fresh from solving her first case and restoring a map to the New York Public Library (Into the Lion’s Den, 2016), Devlin takes on dinosaur hunters out to foist a great forgery on the public from within the hallowed halls of Manhattan’s American Museum of Natural History. As the book opens, Devlin and her friend Katie, both white, are volunteering on a summertime dinosaur dig in Montana’s Badlands, where things go awry. Returning to New York, Devlin and her African-American friend Booker Dibble are able to use the vast computer resources of the NYPD because Dev’s mother is the police commissioner. They are also able to employ a CT scan because Booker’s mother is an orthopedic surgeon. With time out for Katie’s birthday party, held in the hall of the Titanosaur at the AMNH, Dev pursues her case with her usual total focus. Sleuthing is full-time, she informs Booker, who wants to eat lunch, not a “23/7 kind of job.” Readers will enjoy a glimpse into the world of fossil hunting, especially in China; one of the college volunteers on the dig is Chinese. There’s also a view of the AMNH research facilities. Dev triumphs in a grand finale that involves dusty footprints, a statue of an eagle, and the fire department.